When looking for a new designer to love, especially in the jewellery world, it often seems as if we must choose style over soul, or price over meaning, ending up with pieces that are bought impulsively, destined to be left cold in jewellery boxes after only being worn a few times. Which is exactly why Seven Saints, the California-based jewellery company that creates stunning unique pieces, like aromatherapy lockets, mala bead necklaces and tassel bracelets, is so special. One encounter with the brand’s founder Kaliah Shil’Ee, and you’ll quickly understand why Seven Saints isn’t like any other jewellery company. During our exclusive interview with Kaliah she divulged that she had always known that she wanted to start her own jewellery line, but, as with everything in life, it was all about the timing. 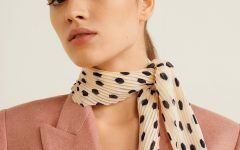 On a four-month trip to India, the universe finally started lining things up, the artisans she met in far-flung villages offered her the inspiration she needed to finally put her ideas for Seven Saints into action and she went to work designing her first collection. Bridging the gap between style and spirit, Seven Saints now offers collections for men and women that are infused with symbolism, powerful tokens for healing and well-being. Although each collection has garnered much praise, it is the ones, like The Angel Heart Collection, which offers beautiful pieces adorned with delicate angel wings, that compel women to ask the question, “Where did you get that?” And, like that, Seven Saints grows. Other notable standout collections include The Aromatherapy Jewellery Collection, which offers beautiful pendant lockets that double as your own personal, on-the-go essential oil diffusers, and The Chakra and The Lotus Collections, both of which pay respect to the Eastern yogic traditions, something that is sacred and personal for Kaliah. Kaliah’s favourite collection, The Sacred Script Collection, then makes complete sense, each piece offering its wearer beautiful blessings, such as “May All Beings Be Happy And Free,” written in traditional Sanskrit on pieces like pendants, earrings, and bracelets. What made you decide to start the business? and Why the name Seven Saints? I had known for a long time that I wanted to start my own jewellery business, it was just the timing of it. The idea and concept for the business literally came to me, as well as the name, during a week when I was undergoing a special seven-night meditation to find clarity. Seven is believed to be a very spiritual number representing many things like creation, completion, and spiritual strength. Where did your love of the spiritual come from? My love of the spiritual started when I was quite young. I was exposed to a lot of different cultures and traditions through travelling with my family from a very young age and it was something very instinctual within me to resonate with the different types of chanting and prayer rituals that I would hear in different places. I did not have the easiest time growing up, and like many people went through some very dark periods in my life. Finding my way to practices like yoga and holistic and alternative healing techniques is definitely what brought me back to life again and gave me a sense of purpose. Yoga & Meditation, what else do you do to relax or enjoy in your spare time? I love playing games with my kids, going on bike rides together, going out dancing, hitting the beach, and travelling of course! I also love to read. You were born in New Zealand, how did you end up living in California? I originally came to California to attend fashion school in Los Angeles where I studied Jewellery Design. Which is your favourite jewellery piece and why? 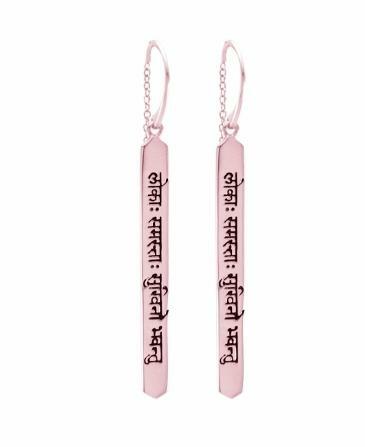 My favourite piece of jewellery is anything in the Sacred Script Collection – like the “May All Beings Be Happy and Free” drop earrings. I believe that there is great power in wearing sacred mantras close to your body and seeing them regularly – just as much as in chanting them. You mention that all of your products are handmade, where or how you source your materials? All of my products are carefully handcrafted using my own custom designs and components, and I do a large majority of the fabrication myself in my studio. I’ve put so much blood, sweat, and tears into making the best quality products that I can possibly make and am always looking for ways to keep improving. I source things like my gemstones from a variety of sources, both local and overseas. Who are Seven Saints’ customers? The Seven Saints customer is a modern day, multi-faceted, conscious woman. She’s not bound by age. I get such great satisfaction when both mothers and their daughters come together to shop for my pieces. Or when women buy pieces for the mindful man in their lives. The Seven Saints customer is interested in being the best version of herself, probably a hippie and bohemian at heart even if she doesn’t let that show! She believes in the healing properties of gemstones, and no doubt she has a healer’s spirit, regardless of what career or line of work she’s involved in. And finally what are your plans for the future? I would like to develop the men’s collection more. I’ve sidelined it somewhat because I enjoy designing for and marketing to women so much, but I feel there is more potential there for me to discover. I’d also really love to expand into homewares in the future and create a true lifestyle brand. 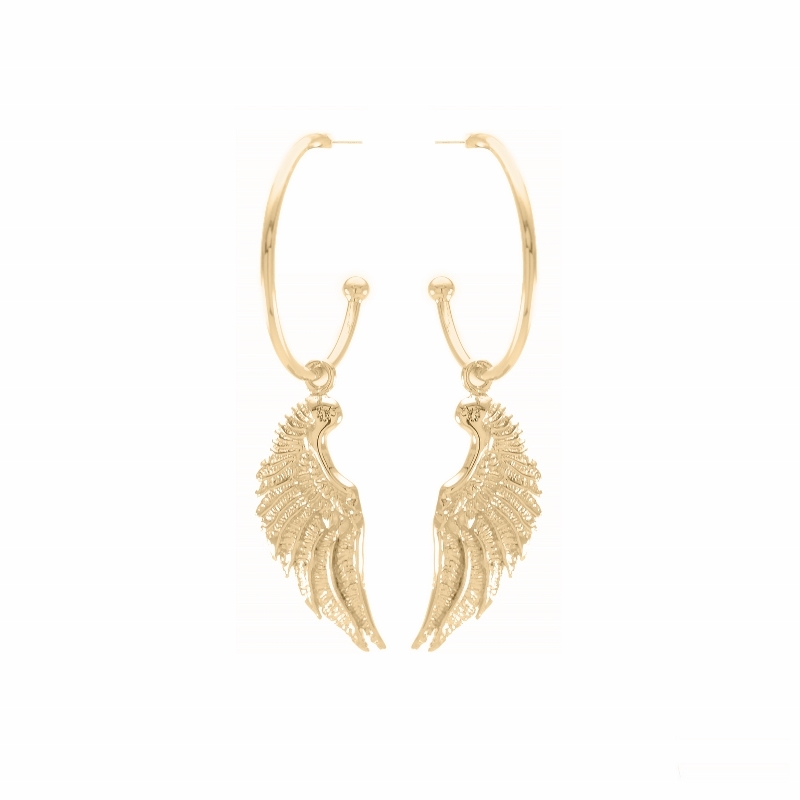 Connect with something truly divine when you wear these beautiful Angel Wing Hoop Earrings from The Angel Heart Collection, available in 18k Gold Vermeil, White Rhodium Dipped Sterling Silver or Rose Gold Dipped Sterling Silver. Matching Angel Wing Cuff and Angel of Mercy Bangle with Amethyst or White Clear Quartz Gemstones also available. 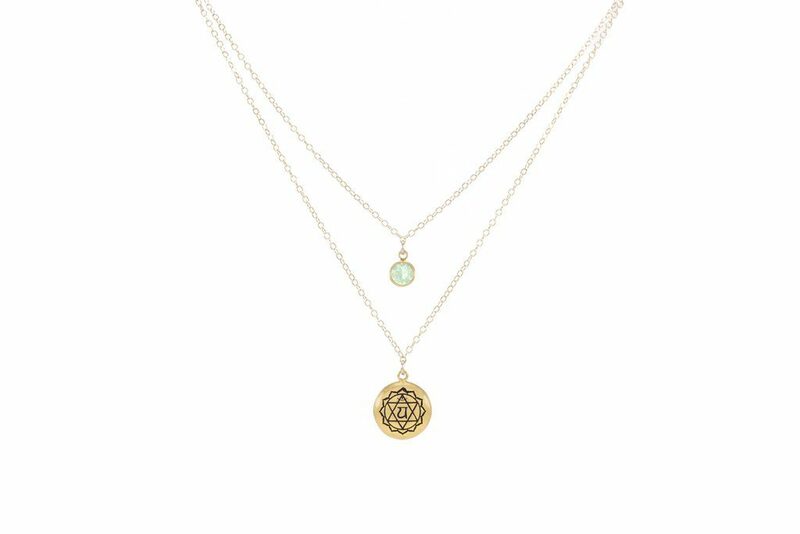 From The Chakra Collection, two strands hold two important pieces for your heart on this stunning yet simple Heart Chakra Anahata Double Strand Necklace. A green crystal symbolizes unconditional love and forgiveness, while the brass charm is emblazoned with the traditional symbol for the Heart Chakra. Available in 18k Gold or White Rhodium. 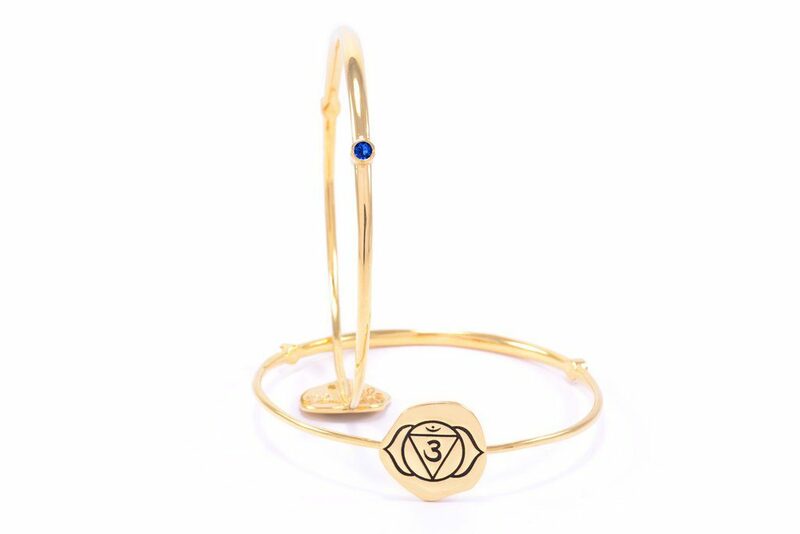 Also from The Chakra Collection, the Brow Chakra Ajna Bangle with two royal blue Iolite stones. The brass bangle is worn to open your third eye, or Ajna as its also known, this piece is elegant on its own and downright dangerous (in the best of ways) when stacked. 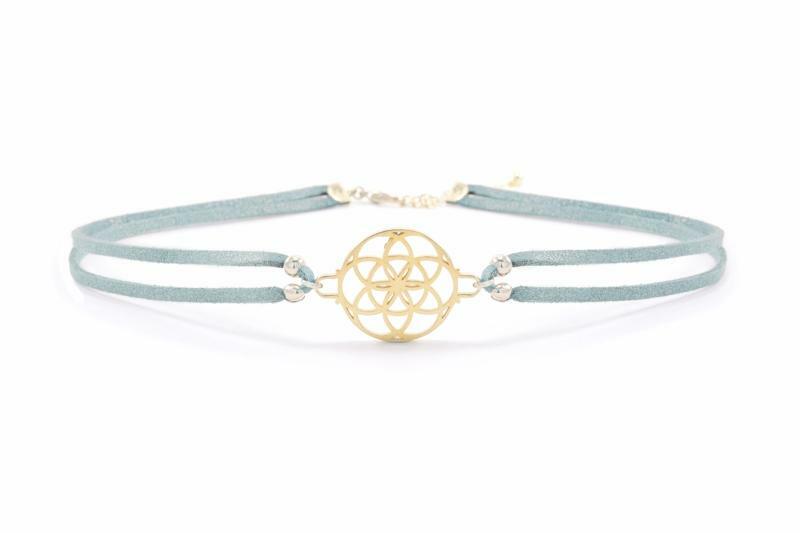 The Seed of Life Vegan Suede Choker is the perfect example of Seven Saints’ ability to infuse spirit into style, this choker is cruelty-free and all about the beauty of sacred geometry. Available in Aqua (as pictured above) or chocolate, to match with any outfit. 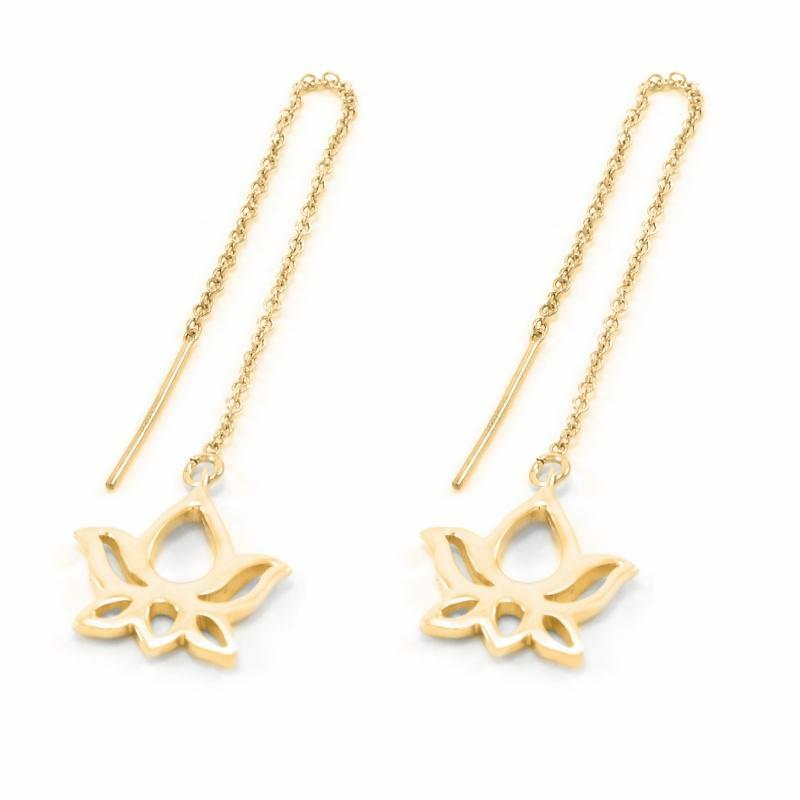 The unique Lotus Threader Drop Earrings from The Lotus Collection put the beautiful symbol of the lotus flower on show, delivering the promise of an enlightened spiritual path ahead. Available in two sizes and three finishes, gold, rose gold or sterling silver. 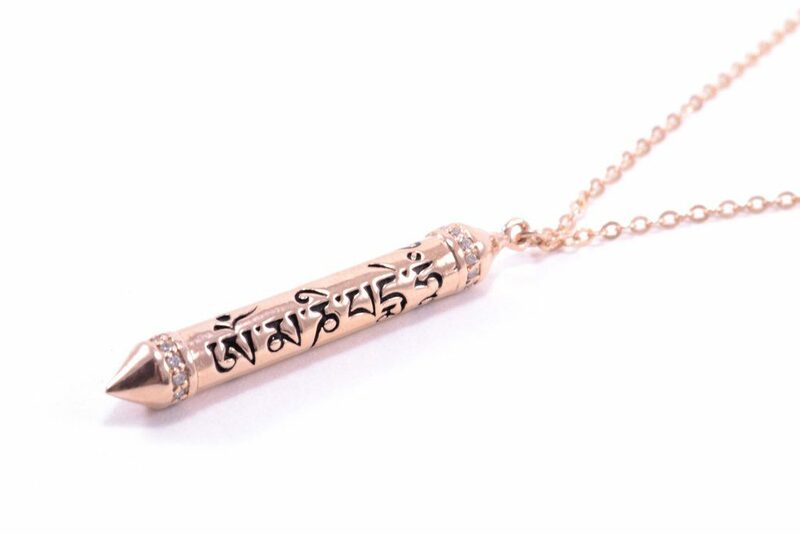 From The Sacred Script Collection, The Om Mani Padme Hum Diamond Prayer Necklace is essential in more ways than one, the stunning pendant contains an engraving of a chant that is said to contain all of Buddha’s wisdom. 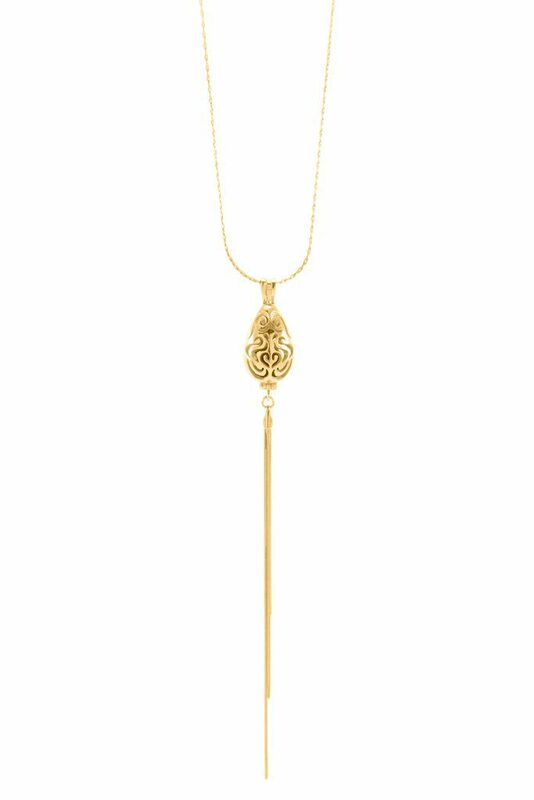 Available in rose gold, gold or sterling silver. 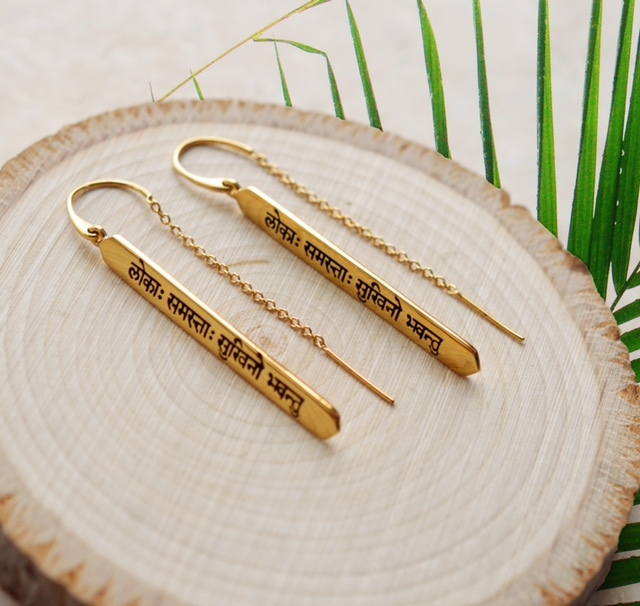 Also from The Sacred Script Collection, The Sanskrit Chant “May All Beings Be Happy and Free” Thread Earrings in rose gold finish, feature an ancient chant with a hopeful blessing for the world, these delicate earrings are anything but, promising the power of peace for all beings everywhere. Also available with a 18k gold vermeil or sterling silver finish. 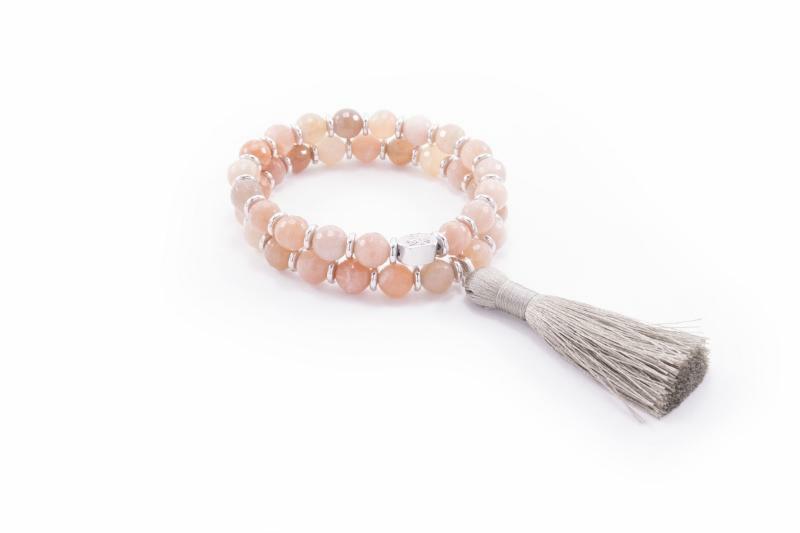 From Seven Saints’ Wrist Mala Tassel Bracelet Collection, The Good Luck and Success Wrist Mala has been designed with sunstone to harness its ability to create happiness and success, this mala bracelet is the perfect gift for friends and family – and yourself! 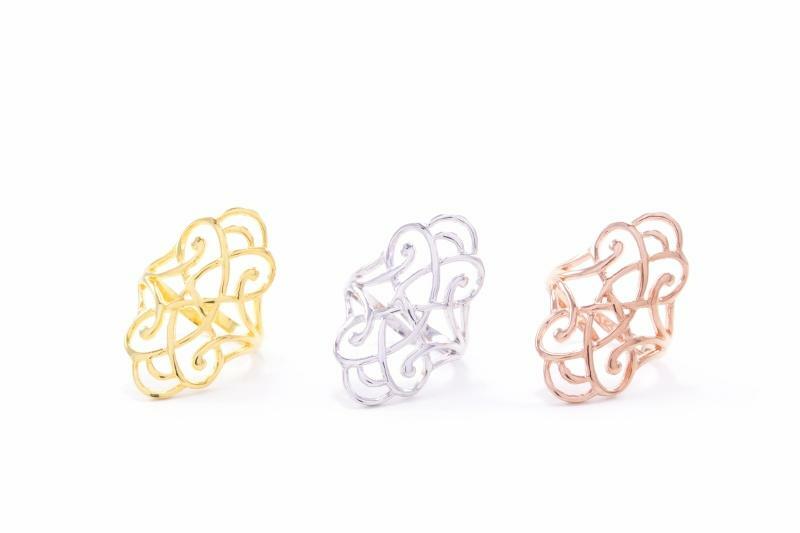 And finally the Infinite Love Foliate Ring, available in gold, silver or rose gold, with a design reminiscent of beautiful art deco style. A statement fashion ring is always something to love, but when it’s also a symbol of infinite love, its impossible to resist.